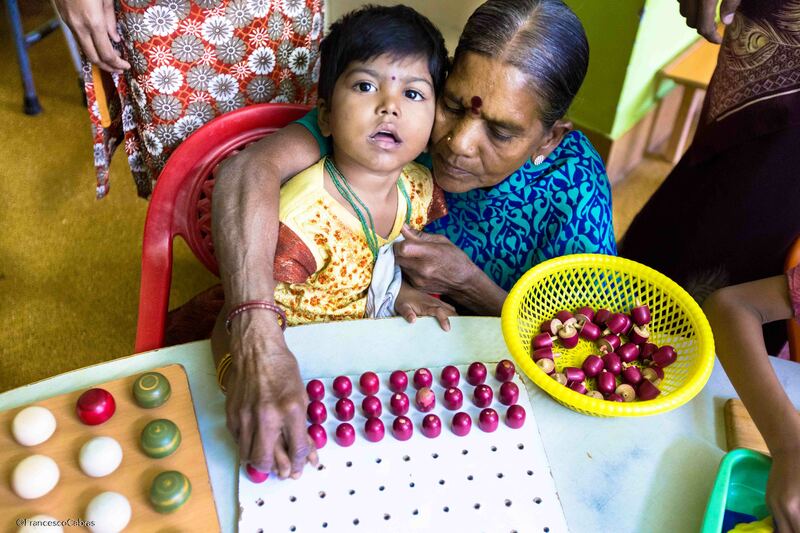 Indian social stigma about disability is not easy to handle: very often mothers who have babies with these conditions are not supported by the community who usually is neglecting and disrespecting them. In reality, there is no cure for cerebral palsy, but an early diagnosis gives to the child the opportunity to find ways to overcome the challenges due to the condition. Our EICs have rehabilitation sessions that involve children and their respective mothers: this means that professional physiotherapists will support the mothers to handle the disability of their little kids and they will stimulate, educate and support the kids to become adults with their own integrity and dignity. We have 3 Early Intervention Centres in Tiruvannamalai area: one in Tiruvannamalai city, one in Thandarampet and another in Chengam. In each centre daily there are several practices. In the early morning, children with their moms sit together in a circle to practice a special yoga session: each mother take care of movements of her own child. This means that for many kids a lot of movements are painful and not easy to be done, but moms are there, all together, in a special energy of interaction and acceptance, to help their children to move and act in the more freely way possible. Srivarshini is a child with Autism. Her grandmother is taking care of her, bringing her each morning to the centre. When she arrived the first time she couldn’t walk, she was having no toilet control, and she couldn’t be able to talk. After some years at our centre, now she can stand and walk without support, she can speak some words, recognise toilet needs and communicate with other children. The love of her grandmother, together with the support of the centre, have really made the difference for this little hero.